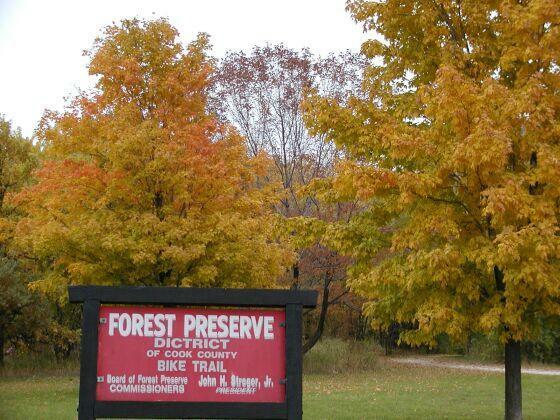 HIGHLIGHTS: The Ned Brown Preserve is a 3700 acre holding located in northwestern Cook County. This preserve, also known as Busse Woods, surrounds Busse Lake, a 590 acre lake that serves as the focal point of the area. The Busse Woods Bicycle Trail is located throughout the Ned Brown Preserve in northwestern Cook County, Illinois. This Class I bicycle trail is currently 11.2 miles long and winds through the meadows and forests around Busse Lake. Hikers can also use the trail but should yield to cyclists. On our walk, we were able to get in about a mile on the scenic trail before the sunset and it got dark on us.